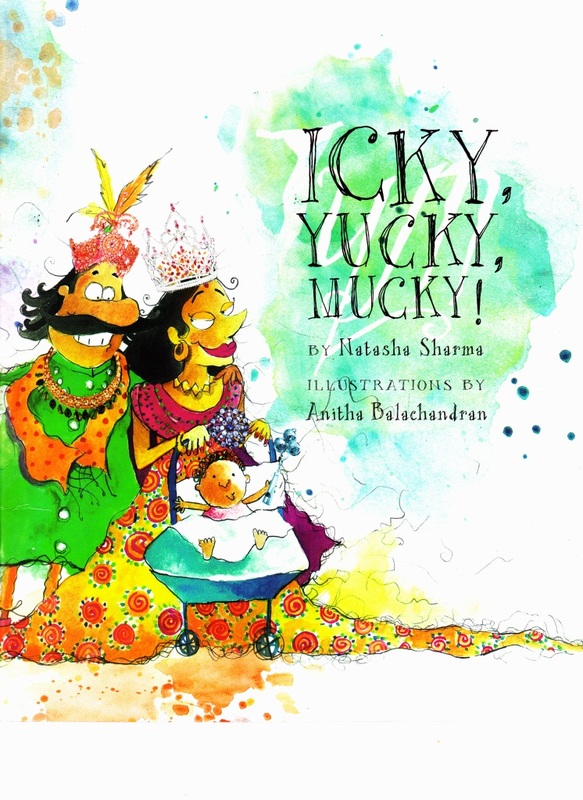 Icky, Yucky, Mucky, as the name suggests, is truly one of the most disgusting books I've ever had the privilege of reading to my children. Goo, poo, snot and projectile rosogullas are just the tip of the iceberg. The book certainly does not let the title down. The Maharaja of Ickhtarpur aka Maharaja Icky has the foulest table manners ever seen. From glugging down soup and letting it trickle down his chin to snorting through sherbet and squishing fistfuls of food, his ill-mannered ways know no bounds. Even the mirrors of the durbar have cracked in disgust. Now King Icky has been on the lookout for a suitable bride but his manners (or the lack thereof) have led to many a princess fainting on sight, which obviously doesn't portend well for the future of any marriage. And then fate introduces him to King Dukhiman's daughter Princess Yucky, artlessly hidden by a pile of her own bitten nails. It is love at first sight followed by holy matrimony. What happens next is for you kind reader to find out for yourself. Suffice to say, the Kingdom of Ickhtarpur gives up all hope of ever being clean. 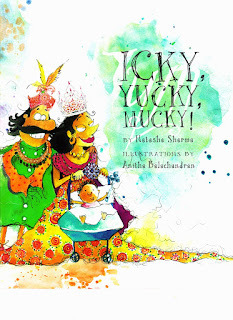 Author Natasha Sharma has her finger on the pulse of young readers and it is roll on the floor-and-laugh-out-loud and cringe-dramatically-at-each-page fun. In a world full of social messages and sermons, this is one for the kids' side. It's almost *gulp* anti-establishment. Yes, it is nice to find books that help you deal with bullies or the death of a pet but every once in a while they should be given a break in favour of out and out icky-ness. Anitha Balachandran needs no introduction and outdoes herself in this one as she did in Mister Jeejeebhoy. Fine details, doe-eyed princesses, mustachioed maharajas, snarky little captions peeking out of places and splotches all over. Simply fantastic. Although Zubaan is usually rather reticent about talking about their books, Sharma has been promoting the book heavily including a storytelling session in full Maharaja costume. You can check out Icky recipes and Yucky art and Mucky moments on the official website for the book at ickyyuckymucky.wordpress.com and even check out a trailer here. Delhi readers can click back to my blog for a list of upcoming events related to the book. Fastidious parents might shudder at it, but this one has the kids' vote. The book sounds super cool. I am sure kids will love it. The title alone says "pick me up". Very interesting TMM. Will look out for this. Where to purchse this book from as Flipkart isnt providing the book...any other way out? ?